wedge no COG adjust Slot – TxChemist************Winning is fun! 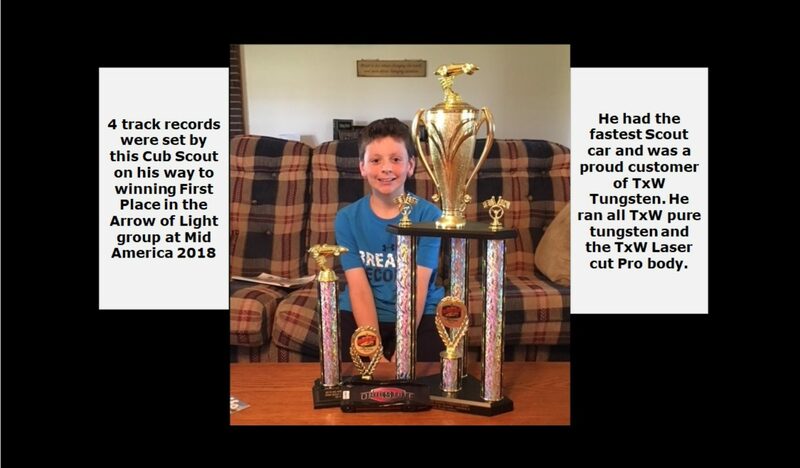 This product is for Pinewood Derby, Awana, Royal Rangers and other organizations that have races similar to the Pinewood Derby. 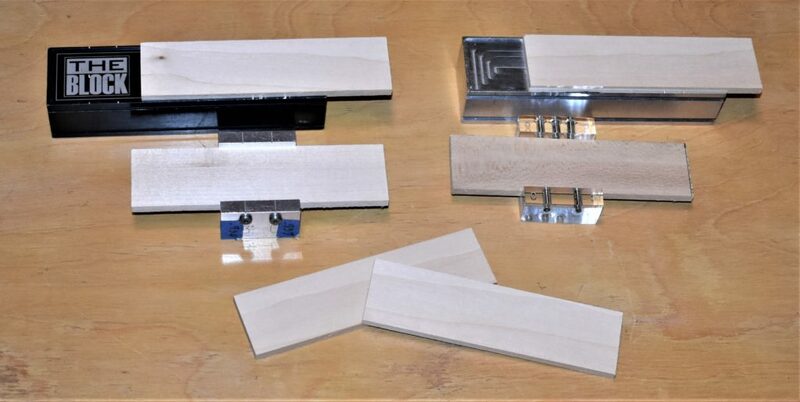 Our Wedge blocks have been cut into a very low wedge shape. The back is 5/8″ high and the front is 3/8″ high. Typical low cost wedges contain lead and will not have the speed that tungsten can bring to the design. This is because you can move the COG farther back in the car with tungsten. Why put up with LEAD when for a few dollars more you can get real speed with tungsten? The Mini-slots allow you to drill axle holes just over the shallow cuts made in the block at the standard distance. 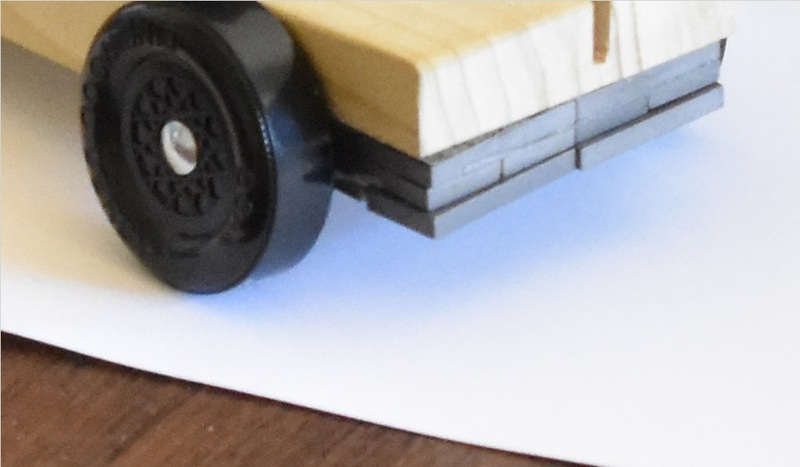 You can extend the slots with a saw and install your axles if you want, but the cars with drilled axle holes will generally be much better aligned and therefore faster. Tungsten weights of 2.5 oz are pre-installed all behind the back axle. (10, 0.25 oz plates are fixed together and glued in place. This is much more aggresive than you can typically buy online. Extra weights of 0.5 oz are included that can be mounted in the weight pocket, or taped to the car on the bottom. 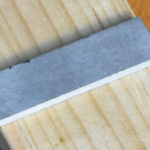 You may remove some wood and make it into your own design. 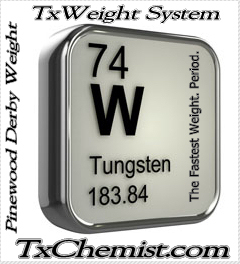 If you need more than 3 oz of weights, we recommend that you use our TxW Tuning weights to fine tune your Pinewood Derby car’s weight to 5 oz. The finished car will have metal tape covering the weights (included). 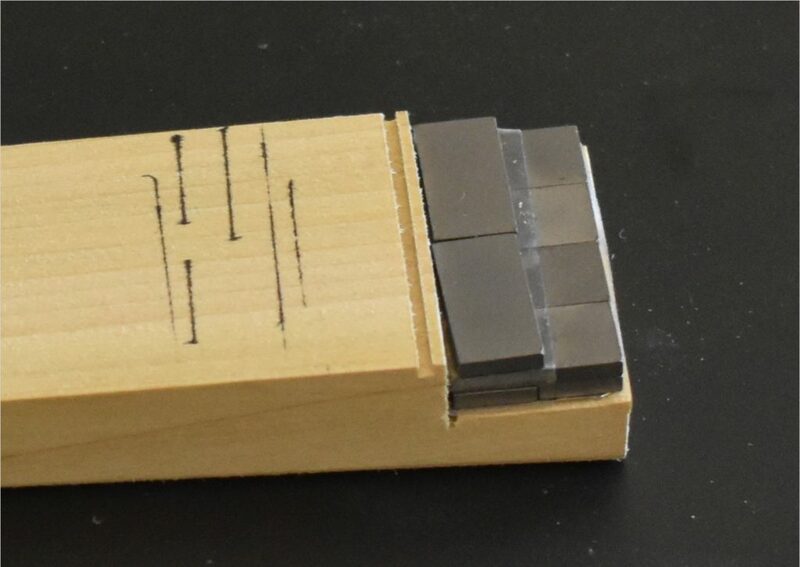 Note the shallow slots where the standard block would have deep slots. Example of car with all 3.0 oz installed behind the back axle, and wheels on the car for COG measurements. Did you know that most professional pinewood racers do not even mess with measuring where the COG is? They have built so many cars that they know what works for them and what will not work. How does that help a new builder? We can offer a guide that you can have some degree of confidence with. Measure the weight on the DFW. What is the DFW? That is the wheel the front of the car rides on and the other front wheel will usually be in the air. If the rules require all 4 to touch, the 4th wheel will have about 2.5 grams on it. The photo below is a set up to measure all 3 weight bearing wheels at the same time, but you can get by with just getting a small scale under the DFW while keeping the car level and the back wheels on something level also. In this example, 10 grams will probably be too light and the car may wiggle badly and be slow. A few of the top Pros can run fast at 11 grams, and many more are fast with as much as 15 grams. This wedge can run with 15 grams on the DFW and be stable after correct drift is set up. If the car has no drift, you would be safer to run the DFW at around 20 grams. We must warn you, if you do not drill the axles carefully, you can get the wiggles even with 25- 30 gram DFW and will not have a fast car. Do not buy this kit if you have no way of drilling accurate axle holes. The above tools all can produce exceptional alignment when used properly. There may be others that are similar, but low cost tools often do not have the tolerance to produce super fast cars. Here are some guidelines to use as a general rule of thumb. Your experience may allow you to push close to the edge. New racers should stay safe until they have a few cars build and observed running on a track.